A Video is viral again which has been making rounds on social media for more than a year. 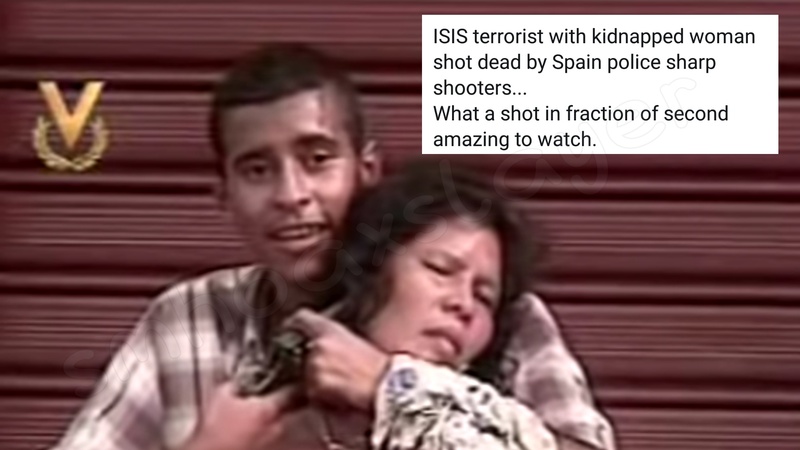 A man is holding a woman as hostage on gun point, while a sniper shoots him dead. Gyan Prakash Mishra ‘s tweet has been retweeted more than 500 times. Mostly people emphasized on the perfect aim by the sniper appreciating it, which killed the criminal and freed the woman hostage, and as few said, it wasn’t about the place or criminal, but the aim, the situation. Year 1998, Venezuela, Man trying to rob a Bakery was surrounded by Police so he hold a woman as hostage while a sniper shot him in head. A woman narrowly escaped with her life after an armed man holding a gun to her head was shot dead by Venezuelan police in Cua on Sunday (5/5). Dramatic video captured the end of a tense, seven-hour hostage stand-off as police marksmen shot 18-year-old Hector Duarte Bahamonte in the head while he held his own handgun to the temple of 44-year-old Nancy Lopez. A woman narrowly escaped with her life after an armed man holding a gun to her head was shot dead by Venezuelan police in Cua on Sunday (5/5). Dramatic video captured the end of a tense, seven-hour hostage stand-off as police marksmen shot 18-year-old Hector Duarte Bahamonte in the head while he held his own handgun to the temple of 44-year-old Nancy Lopez. The violence started after police foiled Duarte’s effort to rob a bakery in the Cua district, 50km south of Caracas. Duarte managed to take several members of a family hostage outside the bakery. Police cordonned off the neighbourhood and began attempts to talk to Duarte, who shot and wounded two of his hostages, also injuring himself in the arm. Duarte repeatedly rejected police efforts to resolve the situation peacefully, and threatened to kill Lopez, who is pregnant. She remained fairly calm throughout the ordeal. When interviewed by reporters the next day, she said she had been “born again” by the experience and asked God to forgive Duarte. ← This ‘distant village’ which had it’s first road is in Indonesia ! February 1, 2019 Tiyashi Datta Comments Off on Turkey’s highway photo is viral claimed as Mumbai-Goa NH66.